Annapurna Base Camp Trek - Blue Mountain Travels and Tours (P.) Ltd.
Annapurna Base Camp or ABC Trek is one of most popular, moderate nature trekking trials in Annapurna region of Nepal. Travelers or Tourist, who comes to Nepal, goes to this base camp for trekking, hiking, climbing and expedition. There are many attraction on the way, Ghandruk and Chhomrong Gurung village and Natural hot spring village Jhinu, the panoramic view of Himalayas range, flora and fauna, amazing culture and lifestyle, and get chance to see wild animals of Himalaya like Musk Deer, Thar, Leopards and various species of birds are some of them. 7 Days Annapurna Base Camp is situated at 4130m (13550feet) above sea level lies along with Lamjung Himal from the Kali Gandaki in west to the Marshyandi in east in central north part of Nepal. Blue Mountain Travels and Tours arrange the Annapurna Base Camp – 7 Days from Pokhara or from Kathmandu. One has two options for the 7 Days Annapurna Base Camp Trek. Option 1 Pokhara: One will drive from the Hotel in Pokhara to Kimche and trek starts. Option 2 Kathmandu: One will take and early or first flight from Kathmandu to Pokhara and drive to Kimche and trek starts on the same day. If one also like to go to Ghorepani and Poonhill with this trek, add extra 2 days that will be total 9 days trekking period. We, Blue Mountain provide an excellent service to our customers, keeping our price as competitive as possible. Our entire prices are crystal clear and there are no hidden cost on cost includes and excludes. Our guide and porters are paid according the Nepal porters union. Our trekking staffs are best paid in Nepal and have the experience license trekking guides and have healthy strong porters. This the reason all our tourist, trekking customers are happy from our service. Pokhara-Kimche and Siwai-Pokhara by private vehicle, Jeep or Bus. Breakfast, Lunch, and Dinner tea/ coffee in a cup (All the Meals) and accommodation during the trek. One experienced and qualified English speaking guide and Trekkers 2:1 porters. Guide/Porter’s: food, lodge, transportation, salary, insurance, equipment etc. Local fresh fruit like Pomegranates and apple etc. Annapurna Conservation Area Trekking (ACAP) permit and TIMS (Trekker’s Information Management System) card permit. Fingertip Pulse Oximeter for every day to check your oxygen level and pulse in your body to avoid high risk. Blue Mountain Travels and Tours T-short. Today is a moderate day, you will trek from Ghandruk to Sinuwa (2340m). It takes 6-7 hours walk. The trail from Ghandruk to Komrong Danda is slowly up. From Komrong Danda, you will trek down to Komrong Khola. Again climb up to Chhomrong, Chhomring is another nice and big village. From this village, you will trek down to the river and will climb again to Sinuwa. If the weather is nice, you will have nice view of Mountain range, overnight at Lodge. In the morning, you will have the nice view if the weather is good. After that, you will have breakfast. You will trek from Sinuwa to Deurali. The trail is mostly uphill and jungle walk. It takes 6-7 hours walk. You will pass Bamboo, Dovan, and Himalaya during the trek. Deurali is located 3200m, overnight at Lodge. Today, you will trek from Deurali to Annapurna Base Camp. 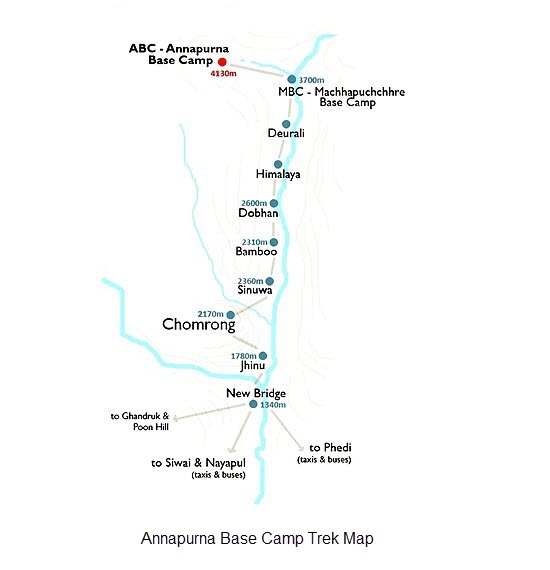 Annapurna Base Camp is located 4130m. It takes 5-6 hours walk. The trail is all the way uphill. When you arrive at Machhapuchhre Base Camp, you will have again the nice view of Machhapuchhre, Annapurna South, Himchuli, Gandharva Chuli, Glacier Dom, Annapurna III, Gangapurna etc. 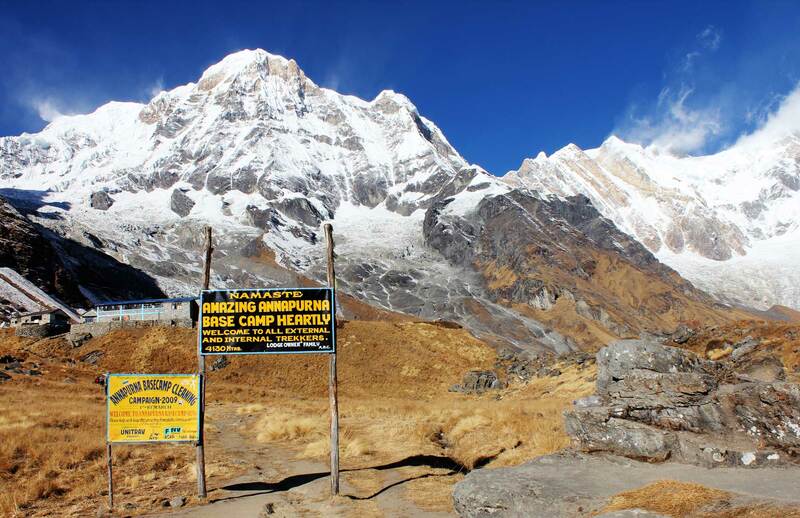 You will continue to Annapurna Base Camp, overnight at Lodge. If the weather stays nice, you will view the nice sunset from here. You will wake up in the morning to see the nice view of Annapurna I, Barahi Shikhar, Tent Peak, Annapurna South, Himchuli, Gandharva Chuli and sunrise. After that, you will have a breakfast. Trek from ABC to Bamboo via Machhapuchhre Base Camp, Deurali, Himalaya, Dovan, and Bamboo is all the way down. It is located 2340 m. It takes 6-7 hours walk and then overnight at Lodge. After the breakfast as usual time, you will trek from Bamboo to Jhinu Danda via Sinuwa and Chhomrong Village. Jhinu is located1690 m elevation. It takes 4-5 hours walk. The trail is up and downhill. In the afternoon, you will be in the Natural Hot Spring, overnight at Lodge. Optional: If you do 7 days trek from Kathmandu to Kathmandu. You will continue from Bamboo to Kyumi. Trek from Jhinu to Siwai (3-4 hours walking). From Siwai, drive to Pokhara. It takes 3 hours’ drive, overnight at the Hotel in Pokhara. Optional: If you do 7 days trek from Kathmandu to Kathmandu, you will trek from Kyumi to Siwai then drive to Pokhara airport directly, overnight at Hotel in Kathmandu. International airfare and visa fees ((15 Days US$25 and 30 Days US$40. Hotels and meals in Kathmandu and Pokhara we will arrange Hotel if you ask. All the drinks such as coke, beer, Drinking water, WIFI, Hot Shower etc. Tips for your guide and porters etc.